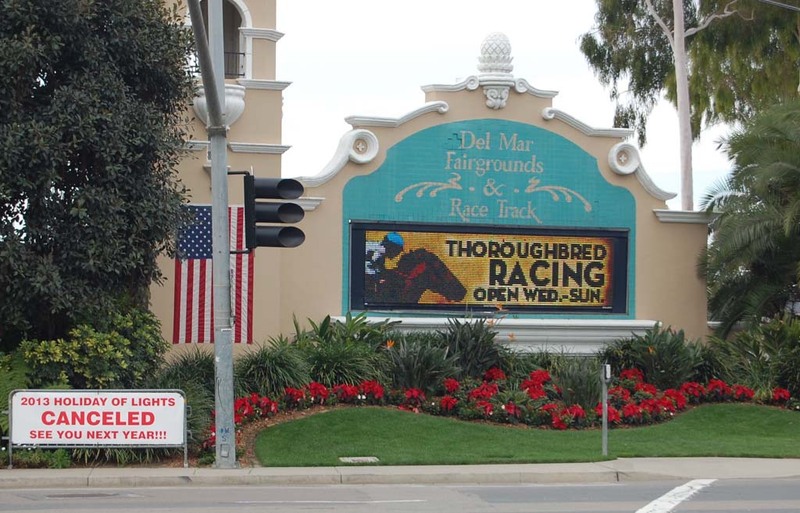 DEL MAR — As many people discovered, some after driving to the Del Mar Fairgrounds, the 2013 Holiday of Lights was canceled this year because of an ongoing project to widen the turf track. And according to the facility’s general manager, the future of the event is not too bright unless another location is identified. What would have been the 19th annual event was dark this year as work continues to widen the track to increase safety and accommodate more horses in anticipation of attracting the Breeders’ Cup. Some improvements are also being made to the main synthetic track, Fennell said. With the Dec. 22 closure of Hollywood Park, the 22nd District Agricultural Association, which oversees the fairgrounds, received approval from the California Coastal Commission on Nov. 13 to add a fall horse race meet, the first of which is slated for Nov. 5 through Dec. 7, 2014. Holiday of Lights, a drive-through event featuring hundreds of holiday scenes formed in thousands of twinkling lights, usually opened the night before Thanksgiving and ran through the first Sunday in January. Last year 78,000 people in 19,561 vehicles at a cost of $15 to $20 per car and $50 per bus drove through the attraction. A Holiday Hayride was added in 2009 that allowed visitors to tour the light display in the back of an open hay wagon for $10 per person, including hot chocolate or cider and a holiday cookie. Despite the lost revenue from the event, Fennell said the 22nd DAA is on track to have one of its best years ever financially in 2013. Signs informing visitors the show is canceled this year also state, “See You Next Year.” But anyone planning to attend the event in 2014 should check the fairgrounds’ website before driving to the Del Mar venue.